October 10, 2013 Posted in Travel Posts. I have been in Hiroshima today and had a relaxing day before I head back into the hills for my next farm experience. I will tell you more about what I did in Hiroshima in another post but now I have some random and probably uninteresting facts to share with you. When I last weighed myself it was probably about a year ago, I am usually around 85-95kg depending on what it going on in my life. However since travelling I feel like somehow I have been loosing weight, I have been eating and tried to consume as much as physically possible while it was cheap in Thailand. Even in Japan I have not dieted but I now weigh something like 79kg. Okay thats not much of a change but I have no idea how I lost that weight but the fact of the matter is that I feel great. I was considering if it would be weird to send my last counsellor a postcard, I mean the really odd thing is that I think I should do at least that, she was one of the people who enabled me to turn a dream into a reality. So I want to also introduce you to two things I have experienced in the last two days in Japan, oh and t make this post less/more interesting (delete as appropriate) I have another little video for you. So if you order nihonshu (aka sake) in some places in Japan you get given a glass and some sort of receptacle to put the glass in. This can be a wooden box or china saucer but something as this photo demonstrates. 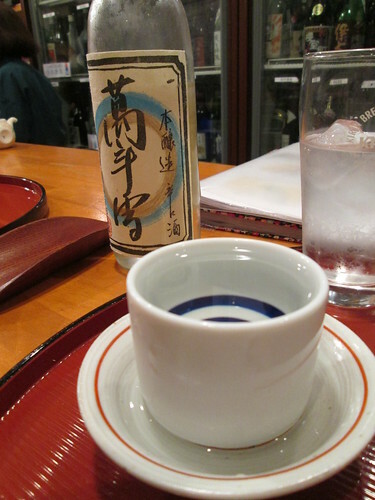 The person pouring the nihonshu will pour so that the glass overflows and some goes into the receptacle. I have seen this in places in the UK and never known what to do with the booze in the receptacle up until tonight when I asked. I have no idea why they pour over the glass measure but what your supposed to do is once you are done with the glass or have enough room is pour what is in the receptacle into the glass and continue drinking. I had no idea that this was the custom and now that I know I will adhere to it. The second thing I experienced today is that sometimes the Japanese act a bit weird around westerners and you really should not take offence at this, it is their issue and you should leave them to it, I’ll tell you how I know. I am an incredibly observant person and I believe I know when people are talking about me but after so many years of people pointing at me it does not bother me but I still notice it. In fact most of the time it makes me laugh because the people that are talking about me try to be discreet but the more discreet that are the more obvious they are. Tonight I walked into an izakaya and was delivered a menu in english which is great but takes away some of the challenge. However I ordered a beer and something from the menu while I sat and minded my own business. A Japanese guy approaches me and speaks to me in Japanese asking if he could sit next to me, and I tell him in Japanese that it’s fine. He sits next to me and picks up the menu closest to him which happens to be the menu that I was given in English. Something in his mannerism changes, a conversation happens between him and some other Japanese guys and then he gets up and changes seats. Now any normal person may be offended by this or find it rude. I currently do not smell (I showered for a change), as far as I can recall I had not farted recently or displayed anything that might make him fear me apart from just existing but still he changed seats. I could not help but laugh at the whole situation and how 3-4 people got involved to find this guy a seat in the Japanese section far away from me. This is what I mean it is their issue and not mine, I have no problem sitting next to someone black, white, green, blue, female, male anything. So yeah the behaviour can be odd, my advise is read nothing into, they may not like who you are or why you are there in their bar, or they may fear you, or they just have this programmed into them, it is their issue and not yours.